How Often Do I Water My Basil Plants in a Planter? A tropical herb, sweet basil (Ocimum basilicum) grows in gardens from U.S. Department of Agriculture plant hardiness zones 2 through 9 as a tender annual. With continued pinching, it forms shrubs that yield a summer of seasonings. Its spicy-sweet essence softens the acid in tomato sauce and brightens scrambled eggs. 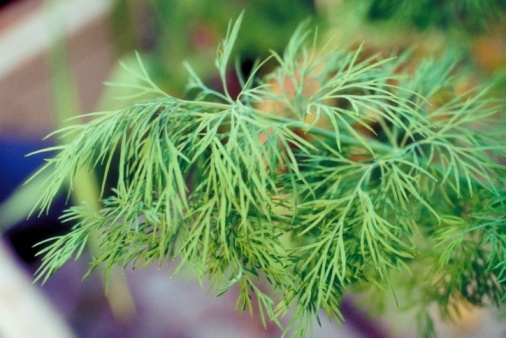 This versatile herb is easy to grow in containers, too -- even moisture keeps it perky. Basil varieties combine to make a container garden. Basil grows in varieties to fill 6-inch terracotta pots and large wood or plastic planters. In addition to common basil, look for lemon basil (Ocimum basilicum "Citriodorum") or dark green cinnamon basil (Ocimum spp. ), both about 18 inches tall, for distinctive scents on a patio or near a window. "Spicy Globe," a compact variety that reaches a height of only 8 to 10 inches, grows equally wide. Lettuce leaf basil (Ocimum crispum) grows to 15 inches and provides large leaves, suitable for Caprese salads. Thai basil (Ocimum basilicum "Siam Queen") grows 2 feet tall. Its licoricelike taste complements Asian recipes. Opal basil (Ocimum basilicum "Purpurascens" and compact Ocimum basilicum "Minimum") feature decorative purple foliage and pink flowers. Hanging baskets are out for basil, though -- basil grows upright and baskets dry out so fast that you'd need to water plants several times a day during the heat of summer. Use a potting mix that contains peat moss, vermiculite or perlite so the mixture drains well and holds air as well as moisture. Give each plant about a gallon of soil -- a 12-inch pot might hold only three plants, but a planter that's 1 foot by 3 feet by 1 foot can hold a dozen -- space plants so they won't grow into each other and limit air circulation when mature -- about 6 to 12 inches apart. Give basil full sun -- at least six to eight hours daily -- and shade when afternoons are hot. It's easy to move smaller containers for best exposure. Position larger containers out of drying winds. Wait until nighttime temperatures stay above 50 degrees Fahrenheit and daytime temperatures are in the 70s to move containers outside. The container must have drainage holes because whenever you water your basil, you will water until it runs out the bottom. As a member of the mint family, basil is a thirsty plant that needs consistent moisture. Never water from overhead and water in the morning to minimize evaporation. Drip irrigation provides the most even moisture. Check the soil moisture daily. Large planter boxes might only need water every three or four days, but small pots will require a daily drink. Plastic and metal containers retain moisture longer than terracotta or wood, but any container could require watering daily or more often during hot or dry spells. 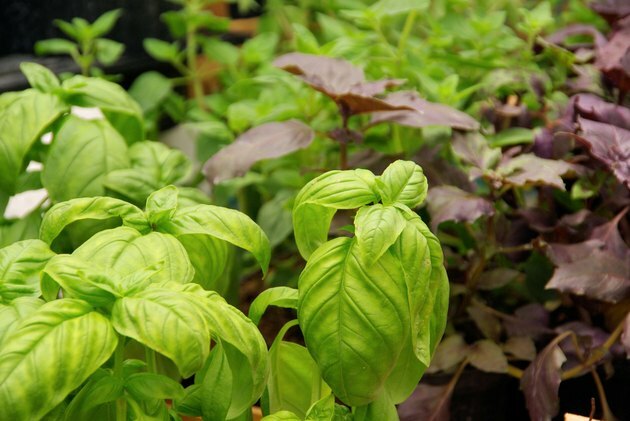 Container-grown basil requires more frequent watering than garden basil because of the exposed sides of the container, and a mulch of shredded bark or compost can help conserve moisture. The surface might be dry, but if soil is moist 2 to 3 inches below the surface, the plant has enough moisture. Plants with too little water yellow and scorch. Plants given too much may wilt, succumb to fungus diseases or develop root rots. Can I Grow Basil & Tomatoes in the Same Container?